One of the main causes of the French Revolution was the financial crisis which forced King Louis XVI to levy a new land tax in the hope of solving his monetary problems. Mainly, the country was ripe for revolt and the scene had long been set for the events to follow. The poor were starving to death on the streets of Paris. In the royal palace, the king’s breakfast consisted of 4 chops, a full chicken, six poached eggs and a slice of ham, washed down with a bottle and a half of champagne. 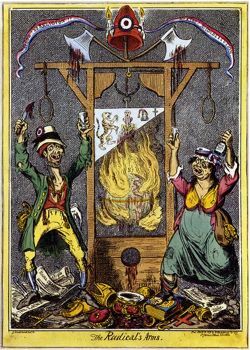 The French Aristocracy, the most spoilt and wealthy in Europe, played, whilst the poor, the starving, the sick, and the tired, became more and more resentful. When new controller general of finance, Charles De Calonne, suggested that France begin taxing the previously exempt Nobility, they refused. Out of the three different tax paying groups or ‘estates’ of the French population, two of them, the Clergy and the Nobility, were tax-exempt. The third and by far the largest ‘estate’ consisted of the general French public who set themselves up as the sovereign National Assembly. Disputes and skirmishes started to break out. Some members of the first two estates joined this new, revolutionary National Assembly, sensing the way the wind was blowing. It was this National Assembly that encouraged its members to show their discontent in different ways, one of them being the storming of the Bastille (from old French bastide, meaning fortress and the Provençal ‘bastida’ meaning built) in Paris. This event marked the beginning of the French Revolution of 1789, and led to the end of the monarchy, and the start of the First French Republic. In the country, farmers and peasant attacked rich estates and wealthy landowners, and continued until the issuing of the August Decrees, freeing them from their contracts with the landowners. The National Assembly soon became divided, as radicals and moderates clashed. Fearing that rebellion against the monarchy would spread over the borders, some countries pushed for Louis’s return to the throne. The assembly declared war on Austria and Prussia. The war with Austria and Prussia didn’t go well for France. In January 1793, the newly named National Convention tried and executed Louis for treason. Robespierre set out on his infamous ‘Reign Of Terror’ in late 1793–1794. More than 15,000 people were beheaded. Robespierre himself was later executed. In the meantime, Napoleon was doing rather well in the war. He returned to Paris, where he lead a Coup against the Convention, setting himself up in 1799, as a much welcome leader of France, and the revolution came to an end.